On Sunday July 15th, the students, parents and teachers of the Lakeview sit-in and People’s School for Public Education let it be known to the entire Adams Point Community that we will not stop fighting for quality public schools and we will continue building a united movement to counter the worst Tony Smith(OUSD Superintendent) and Co. have to “offer”. With the Oakland School Police looking on from across Grand Ave. on the former grounds of the Peoples School, (no doubt wasting valuable taxpayer dollars to make sure that OUSD bureaucrats can move-in to the People’s School) the People’s School Concert & celebration got underway at Splash Pad Park. We kicked off the festivities with a few political speeches from members of the Occupy Oakland Education Committee. Then Eni, a local soul musician backed up by Midnight in the Library kicked off the evening’s live music set. They were followed by Miko, a singer/songwriter accompanied by a keyboardist delivering a couple originals and ending with “the ring of fire” by Johnny Cash. Dregs One and the Digital Martyrs, both Bay Area hip hop artists, energized the crowd with politically conscious vocals mixed with party vibes. 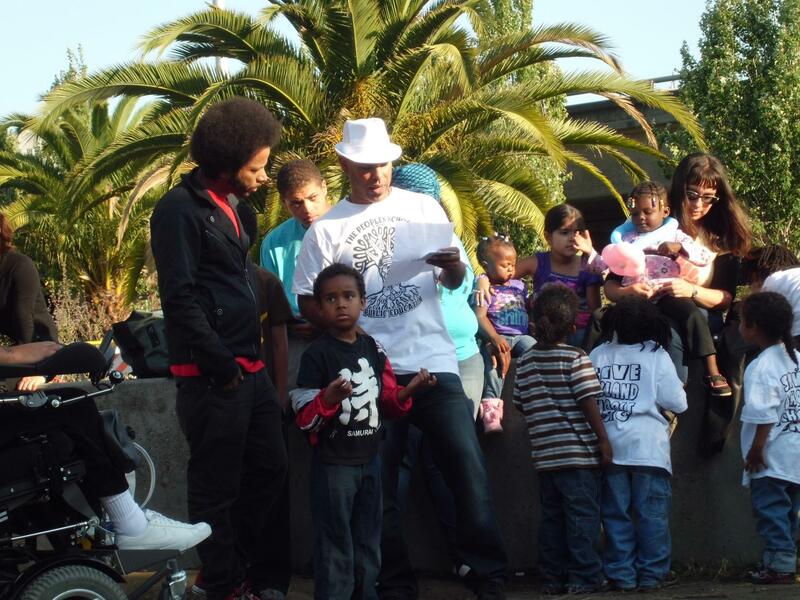 The hip hop continued with a performance by Boots Riley (of the Coup and Street Sweeper Social Club). Boots was backed up by Gabby La la on the funky sitar. They first rocked the crowd with “ghetto blaster” by the Street Sweeper Social Club(Boot’s most recent project with Tom Morello of Rage Against the Machine). And then they finished out their short set with an update of a tune from the days of Harriet Tubman and the Underground Railroad. While we are not entirely sure of the name of the song, we do know from the lyrics – the song provided 5 million ways the working class can rid ourselves of the CEO. Which is fitting if we consider the recent trend to label the head of public education in urban centers as a “CEO”. The current Secretary of Education in the Obama Administration used to be the CEO of Chicago Public Schools, and we may as well call Tony Smith the CEO of Oakland Public Schools with his love for charters and union-busting. To bring the People’s School Concert to a close, Jabari Shaw rapped a variety of his politically charged movement jams. Of which “Chop from the Top” was seemingly directed straight at Tony Smith and all OUSD bureaucrats with their inflated salaries. “I am Oscar Grant” was also apt for this occasion as officer Barhin Bhatts(OUSD Police & the murderer of Raheim Brown) looked and listened from across Grand Ave. Chop from the top indeed! All in all the People’s School and Lakeview sit-in concert was a success. Events like these are instrumental in bringing people together in order to celebrate what was a great achievement for working-class families and teachers. This Sit-in and People’s School set an example in the Bay Area and across the country of the potential the people have to take back what is rightfully theirs and use it(in this case Lakeview Elementary) for its intended purpose – quality public education. By providing a quality mix of politics and culture our committee put its best foot forward to bring more people into this struggle – in Oakland, in New Orleans, in Philadelphia, in New York, and everywhere there are school closures amongst other bureaucratic attacks on public education. Special thanks to Arizmendi Pizza and the Occupy Oakland BBQ committee for providing food for the event, and big big thanks also goes out to the Grand Lake Theatre for its support of our efforts. Thank you!